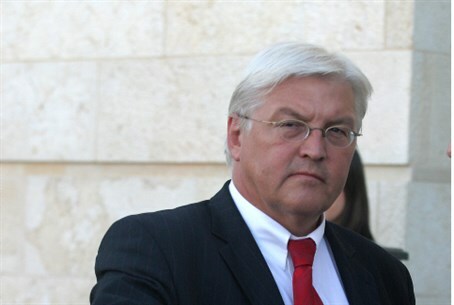 German Foreign Minister Frank-Walter Steinmeier paid his last respects to Ariel Sharon in Jerusalem on Monday, using the opportunity to warn Israel against continuing its building in Judea and Samaria, according to AFP. Steinmeier arrived in Israel late on Sunday, a day after the controversial former prime minister died, on a pre-planned trip to discuss the peace process. It is his first visit to the region since returning to the German foreign ministry last month. But his schedule had to be hastily rearranged to fit around the arrangements for laying Sharon to rest, with Steinmeier representing Germany at a morning memorial service in Jerusalem and later at his burial. Speaking to reporters ahead of talks with Justice Minister and chief negotiator Tzipi Livni in Jerusalem and Palestinian Authority Chairman Mahmoud Abbas in Ramallah, Steinmeier said he would stress that both sides needed to seize positive momentum. He said Germany expected the Palestinians "to do their part" but warned Israel that its presence in Judea and Samaria, and ongoing building efforts there, are damaging the direct talks which began in July. "It is clear that the continued building of settlements really hurts the process," Steinmeier claimed. But it has recently upped pressure on Prime Minister Binyamin Netanyahu to show greater restraint over construction on land the Palestinian Authority wants for a future state as Washington presses a nine-month peace initiative. Last week, Israel unveiled plans to build another 1,800 new Jewish homes in Judea and Samaria and Jerusalem, sparking sharp criticism from Washington and Brussels. Despite the move, Steinmeier expressed optimism over the ongoing direct negotiations which have been championed by US Secretary of State John Kerry, saying 2014 could be a "decisive" year for the Israeli-Palestinian peace process. "The chances seem to be better this time than before," he said. "We back the efforts of my colleague Kerry from the US and are hopeful that we will be successful this time in laying the foundations for a two-state solution," he said. Steinmeier had been due to hold talks with Netanyahu but the meeting was cancelled due to the Sharon memorials, the German delegation said. German Chancellor Angela Merkel is due in Israel next month at Netanyahu's invitation for annual talks between their two governments. Steinmeier served as Germany's top diplomat from 2005-2009, during Merkel's first term.